By the way, we should know if there will be a MOTW 53 or if this will be MOTW 2005.01? Anyway, back to the present: Spitfire, probably the best map maker from russia, already got his third MOTW on BWMN. Like his other two award winning maps, it`s a two-player map. 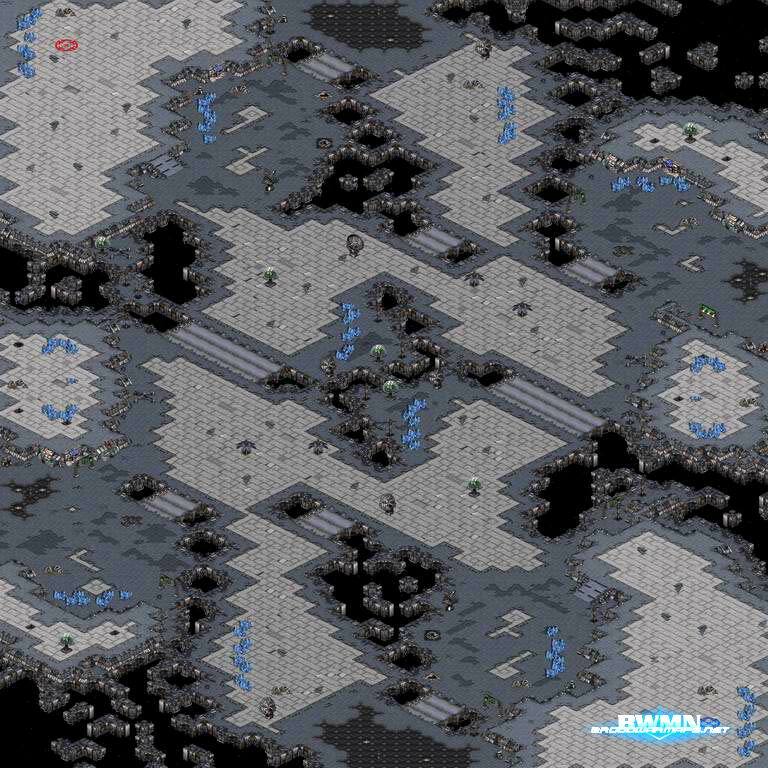 The positions are pretty far away from each other, the very long distance, the huge mainbases, the pretty big battle areas in the middle and the ten gas bases, which is a lot for a two-player map, make it a real macro map. There are still some strategical points, like cliffs for the top right and bottom left expansions, fly-to expansions and some bridges, that are hard to control though. What makes this map so good is that it doesn't force players to play a certain style, so here the players make the game, not the map. LGI and me just played a complete best of nine game on a 3-map mappack. We chose those three maps, because they are the three with best shot at MOTW this time, so this might help doing the right choice. Of course(^^), it had to go over the whole nine games. All replays are in the replay Database, enjoy. This week's Map of the week is pretty experimental compared to most other maps who win it here, because LGI is a mapper who tries new design and gameplay ideas in his maps regulary. On Grapes of Wrath 2.0 (Do not get confused by the old version that is in the database too) he has the natural expansion on the same high ground as the main, but accessible by two ramps. After leaving your mainbase, there are a lot of paths to chose from to proceed. This should allow pretty tactical battles. The level of decoration ingame is very nice because of the huge amount of doodads used. As LGI tests his maps a lot ingame, we can be pretty sure there are no bad bugs occuring ingame. While we have the confidence to say that we are a very strong mapmaking community for melee maps at broodwarmaps.net, we are not that confident in our playing skills :) That's why we can really get excited over a showmatch from two very good players on our maps. Those two players are the bulgarian zerg player eSu.Technics and the norwegian terran eye.Mireille. Panschk:Congratulations to your win vs technics. How much did you practise the maps before? Mireille:I didnt really practise them, I just played a couple of games at everymap and considered some strategys and buildorders on the maps. However I only played 3 of the 4 maps more then once. Panschk:In the 6. game of the series on origo_hills, you had some scv blocked behind gas. How did that happen and how did you get it out of there? Mireille:hm I can't really remember. But there is a very tight main on Origio Hills(like Neo Forte). Because of the narrow build they didnt follow my orders. However i can't really remember it since I focused on the micro of the game and i havnt watched the replays yet. Panschk:Which was your favorite game of the series? I liked game 6 (wraith game) most. Mireille:Yes that was a cool game, but the worst map. First game on Origio Hills I got so badly raped cause i didnt know the map and all the entrys to the expos. However I dicided to play with wraiths in the second game on Origio Hills and it went out pretty smooth. Panschk:What was you impression of technics? I felt like he was stronger in the macro part of the game than micro, while I thought your micro was your biggest strength. Was the result "fair" for both players? Mireille:Hm yes, considering the maps the results where pretty fair. Technics was better then i thought and played very solid. I felt confused in all 8 games and wasnt sure about strategys nore the maps. Technics biggest strength was the maps, he played them allot better then I did and knew exactly what was going on in the game, wich is sad that i couldnt make use of like him. On the other hand I won my games rather easy by just reading hes moves. Some average micro and macro was enough to give me the win. Panschk:Do you think playing "user maps" could become more popular in the months and years to come? In my opinion the situation has already improved a lot in the past two years, remember how it was almost lost temple only back then? Mireille:Ofcorse! When I heard about this showgame with new maps I got very excited. It was really fun to try new maps and be the first one to archive the best strategys of the maps. It's not as easy as it looks. In normal showgames you just watch some replays with some good players of the map. This time I had to decide 100% by myself what to do. The gosugamers MOTW tourney is cool and a prefect way to gain new experience of different maps. Thanks to this and events like Blizzcon or PGT ladder people starting to play different maps then LT.
Panschk:Would you play another showmatch like this some day, and if yes, do you already have some wish for opponent? Panschk:Thanks for the interview.Any greetings or comments? Mireille:shoutout to Draco, hope you accept my invitation to the challange :)! So who won?? Actually i think im gonna proclaim flo the winner.. since its the same distances between all bases no matter position in 2v2 he solved the problem the easy way.. of course you dont get the feel of being close to your ally all the time, but still it is the most playable map of these. You could solve the problems like i did, but it gets very experimental and the question is if it really is necessary to do like that to get the feeling of a teamplayer map. So the winner this time is Allegiance by fLothefreak, thats two SPRMC in a row for you :o congratulations!